Illinois Motorcycle Accident Hip Injury Recoveries | Hupy and Abraham, S.C.
Before your motorcycle crash, you may have given little thought to your hips. Now, however, your hip injury is one of the things that you think about the most. Your injury is causing you physical pain, it is limiting your ability to work and go about your daily activities, and it is costing you a lot of money. Almost all types of hip injuries will require some kind of treatment. Whether you suffer from a dislocated hip, broken hip, bruised hip, strained hip, or another type of hip injury, your doctors may recommend a specific treatment plan. Rest. Some hip injuries will heal on their own if you follow your doctor’s instructions to rest, ice, compress, and elevate (often referred to as RICE). During this rest period, you may be unable to work, drive, walk, or go about your activities of daily living. Medications. Prescription medications may be necessary to treat your pain. Additionally, in some cases, anti-inflammatories may help you recover. Surgeries. If you suffer a tear or broken bone, then surgery may be required to fix your condition. Assistive medical devices. Crutches and wheelchairs may be necessary to help you retain some mobility while you recover from a hip injury. Physical therapy. Whether or not you have surgery, physical therapy may be necessary to help you strengthen your hip and regain stability after a significant injury. Medical costs. This includes all of your hospitalizations, surgeries, medications, doctors’ visits, assistive medical devices, physical therapy sessions, and other healthcare costs. Lost income. If your hip injury kept you from working or earning the same amount of money that you did prior to your accident, then you may be able to include your lost income in your legal recovery. Lost income includes not only lost wages but also any income that you could not earn from self-employment. Out-of-pocket costs. Any other financial expenses you incurred, such as transportation costs, may be included in your recovery. Compensation for pain and suffering. While you do not have a bill for your physical pain and emotional suffering, these damages can be among your most significant damages and should be included in your recovery. This recovery will be important for your future, but it will not happen automatically. Evidence. This evidence will be necessary to prove both liability and amount of compensation that you deserve. It may include the police report from the accident’s investigating officers, testimony from those who witnessed the crash, expert testimony, photographs, medical records, and more. Strong legal arguments. 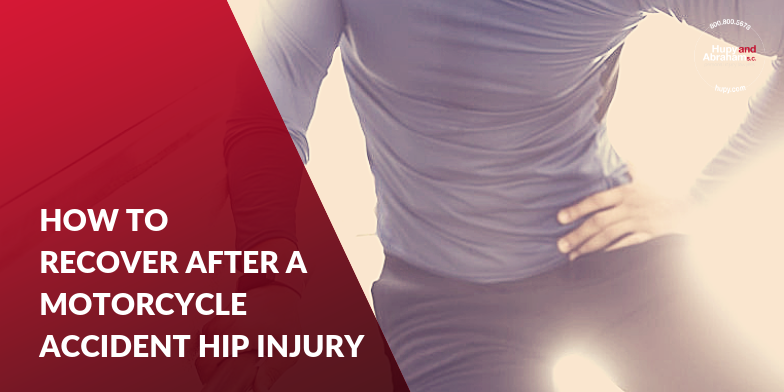 The evidence described above will need to prove whose negligence caused your hip injury. Specifically, you will need to convince the insurance company or court that someone else owed you a duty of care, that someone else breached the duty of care, that the breach in the duty of care caused your hip injury, and that you are legally entitled to recover damages. You do not, however, have to find the evidence and make the arguments yourself. Instead, you have the right to work with an experienced motorcycle accident lawyer who knows what evidence to look for and what arguments to make. Our attorneys are also riders. We believe strongly that anyone who was hurt in a motorcycle crash deserves to make a fair recovery and we will fight hard to make sure that your right to a fair recovery is protected. To learn more about your rights and possible recovery, please contact us any time—24/7/365—via text, by phone, or through this website to schedule a free and confidential consultation. Additionally, you can download a free copy of our book, The Ultimate Guide for Motorcycle Accident Victims, right now to start getting the information that you need to make a fair recovery after an Illinois bike wreck leaves you with a serious hip injury. ?How can I find the right motorcycle accident injury lawyer to represent me after an Illinois bike wreck? ?What should I do if a drunk driver caused my motorcycle crash? ?What should I do if a distracted driver caused my motorcycle accident injuries?